Here are a few facts we at RTC Insurance Advisors want you to know before you shop for your next FL homeowners insurance quotes. We feel that if you are made better aware of the online insurance shopping process, you will enjoy the benefits for many years to come with us. We look forward to having you as a client! Quite a few FL homeowner insurance clients question the validity of conducting business for FL homeowners insurance quotes over the net. Most people who do have had a very good experience if they've worked with the right agent. The majority of the homeowners would rather deal with an independent agent over one single insurance carrier anyway. Of course pros and cons arise when purchasing a policy on the web. 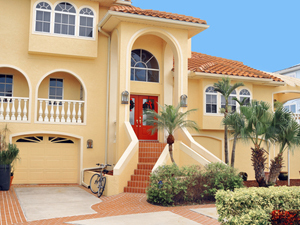 There are no boundaries to receiving FL homeowners insurance quotes over the internet as we are available all the time to satisfy consumers needs. One might say the cost of purchasing coverage this way will be less because of the money wasted on gas and time. Not everyone is happy with ordering a policy online. Some still prefer it the old fashioned way. A common misconception is the homeowner won't be able to talk to a knowledgeable agent, but a wet behind the ears service rep., who might not be as skilled as a seasoned agent. Phone trees are annoying, that's why at RTC Insurance, you will not have to deal with one and we have actual agents here ready to assist you with your FL homeowner insurance. We feel the only way to deliver customer satisfaction is to offer a qualified agent who is fully able to convey the messages quickly if an insurer sends a requirement to our new homeowner client. We understand carrier requirements such as roof age, distance to a fire hydrant and the year of your homes build. These are factors that might prevent you from attaining coverage from a certain company. We know the companies you should insure with so you don’t face an underwriting cancellation. Without this benefit of agent know-how and personal attention to clients, many shoppers may feel the on-line purchasing experience is lacking quality. We recommend for an enhanced shopping experience to use our services for your next FL homeowner insurance. We ensure your policy is in good order and follow-up with you. For a free no obligation consultation, complete our intake sheet or call 352-200-2066. We are also quick to respond via email and take care to make sure you are getting the right policy for your needs. While you are visiting us, also get Online Florida Auto Insurance Quotes today!